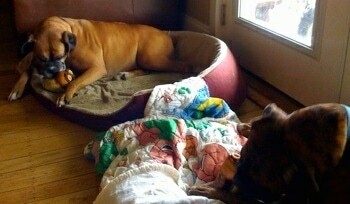 Allie the Boxer has not been able to join Bruno and Tia on their long pack walks. Allie wants to come very badly, however her joints simply cannot handle the stress. Allie is receiving stem cell therapy from Vet-Stem, in hopes it will make her joint pain feel better. 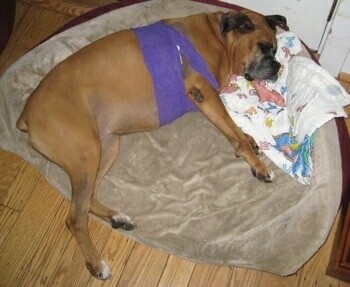 Seven-year-old, 75-pound Allie the Boxer has a fused spine, an old ACL tear in her knee and hip dysplasia. Her left hip was operated on twice, once when she was one year old, and once when she was six years old. Her ball and socket did not line up. The ball of the joint was square shaped, which obviously did not line up with the socket. It was very painful for her to walk. 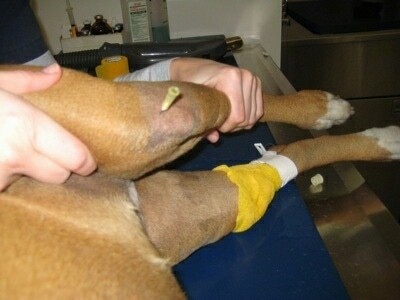 In the first surgery, the ball was cut off, so it no longer rubbed into the socket. Apparently all of the cartilage was not removed in the first surgery and after five years a calcium deposit had grown back where the ball once was. Once again it was very painful for her. She had a second surgery at age six, when they removed where the ball was growing back. 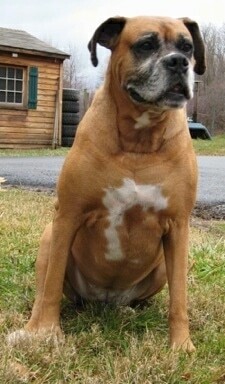 She has limited range of motion in her back leg muscles, and in her right knee. Notice in the picture above, she cannot bend her back right knee into a normal sitting position. I have tried stretching her leg muscles daily using an ultrasound machine, however it was apparent to me her joints were too sore, and since I could not feel her pain, I was hurting her more than I was helping. The limited range of motion is not what is causing her joint pain, so I decided to discontinue the stretches, in fear I would hurt her joints even more. Allie gets a monthly shot of Adequan. She is on Dasuquin, a joint supplement containing glucosamine, hydrochloride, methylsulfonylmethane (MSM), sodium chondroitin sulfate (low molecular weight), avocado/soybean unsaponifiables (ASU) and soy protein isolate. She is also on 400mg of Zubrin (tepoxalin) a non-steroidal, anti-inflammatory drug for pain, taken daily. I have tried various other joint supplements along with a daily dose of Ester-C. Nothing seems to relieve her pain. After many trips to the vet, we ran out of surgical options. We have decided to try stem cell therapy. Next to simply giving her a stronger pain medicine, it is our last-treatment resort. See video clip of Allie before the stem cell therapy. This is her with 400mg of Zubrin (pain reliever). 10-28-08—Day of fat retrieval. Allie was taken to the vet. She was put under general anesthesia and fat was taken from her right shoulder blade. 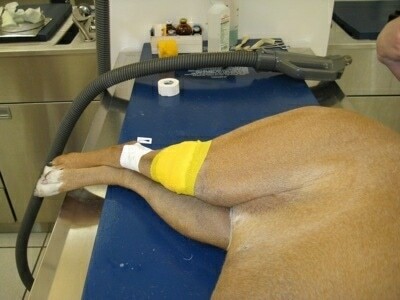 The fat was sent off to the Vet-Stem lab where they will extract the stem cells. I picked Allie up later on the same evening. Allie is receiving her own cells, otherwise she would have to receive anti-rejection drugs if she was receiving cells from any other animal. 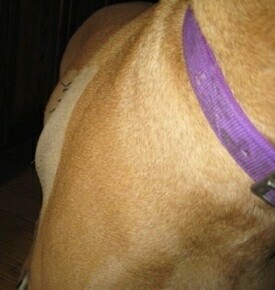 The vet went behind her shoulder because although she looks very lean, there is a deposit of fat located there. There are plenty of cells to be isolated, then spun out using a centrifuge and then placed back into Allie. Stem cell therapy works because the lab can isolate more stem cells from the fat and then inject it into Allie's knees and body. The great thing about stem cells is they are naive, so they don't have a purpose yet, that is until they are injected into her and from there they can turn into any kind of cell that is needed, such as cartilage, bone, tendon, ligament, nerves, smooth and cardiac muscle, liver and fat. 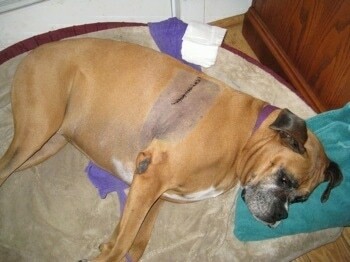 Her incision was bigger than I had pictured it would be. She was tired from the anesthesia. She asked to go outside to do her business. After she came in I gave her a light dinner and her pain medicine. Because of her bad joints and the way her back legs are willing to bend, Allie usually only lies down on her right side. 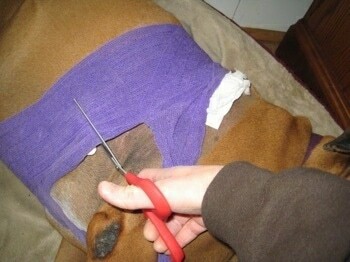 However when she tried to lie down she winced from the incision. Amie and I helped her lay on her left side and gave her a blanket for her head. She was asleep in seconds flat. 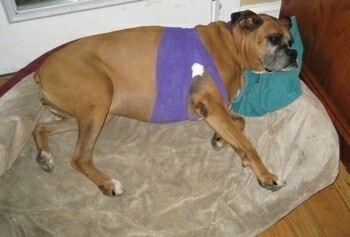 The retrieval of the fat is expected to be the hardest part of her therapy. In two days, when the stem cells come in, they will be injected into her knee joints with a needle and intravenously throughout the rest of her body. The hope is her body will re-grow the necessary tissues to stabilize her joints. This is a new therapy and Allie is the vet’s first case. At this point no one knows how well this will work, not even the vet. Allie woke up in the morning and wanted to go outside to go to the bathroom. She ate a very good breakfast. She usually leaves some food in the bowl, which Bruno and the cats later finish off, however she herself polished it off. I gave her pain meds. After she ate she was standing around instead of going to her bed like she normally does. I knew she wanted to lie down, however it was not an easy task for her. I gave her some Benadryl to help her relax and helped her lie down on her left side. Allie didn't fight it, she allowed me to gently flip her to her side. Tomorrow the stem cells are due back from the lab and Allie will go in for the injections. 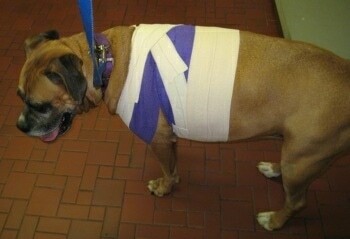 They should not only help her joints stabilize, but they should also help heal her wound where the fat was retrieved. I am doing Allie a favor and treating her the same as any other day, still requiring her to wait calmly and patiently while I prepare her food before I will set the bowl down. 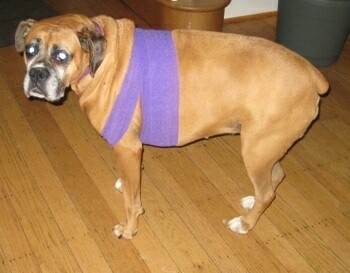 Allie knows she has a sore spot, but she is not seeing herself as an injured dog. Dogs do not feel sorry nor do they dwell. They simply take each day moment by moment. 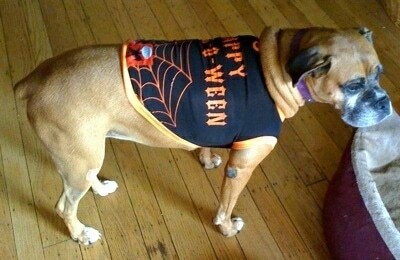 Because dogs can sense human emotion all family members must do the same. In order for her to remain mentally stable she still needs leadership. If the humans around her pity her, she will read our energy as weak. This will either make her want to take over as a leader in order to "save her pack" and/or emotionally upset her because her pack leaders are no longer strong. 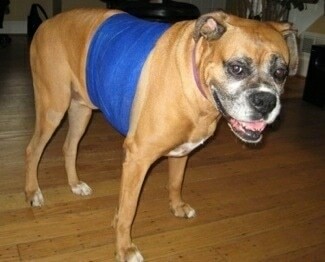 When Allie would walk the bandage would slide down and rub against her incision. 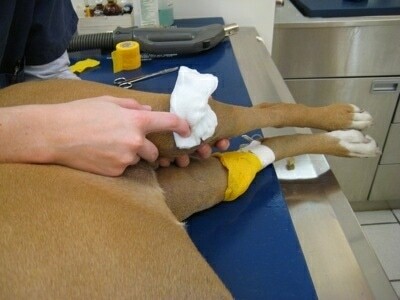 With the vet's permission I cut the bandage off. I need to watch that the area does not swell (fill up with fluid). If it does I will need to wrap her back up. Allie is covered up with a blanket so she does not get cold. Later on the same afternoon Allie got up and went outside. When she came back in I gave her a hoof to chew on. A special treat I save for times I can watch that the dogs do not bite off any chokeable pieces. Every so often I would hear Allie whine, so I gave her more pain meds. The pain meds stated they could be given 1-3 times daily. I also gave her more Benadryl to help her relax. After the painkiller kicked in she really got into chewing up that hoof! A great way to distract her from the pain. A few times a day when Allie appeared to be in a good state of mind I gave her a head and body massage, being careful not to go too close to her wound, to help relax her and keep her in that good state. 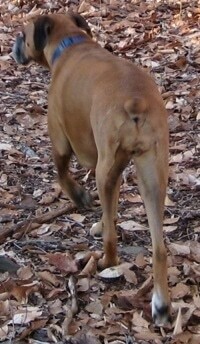 Video clip of Allie the Boxer walking the day after the fat was removed. This is pre-stem cell injection. 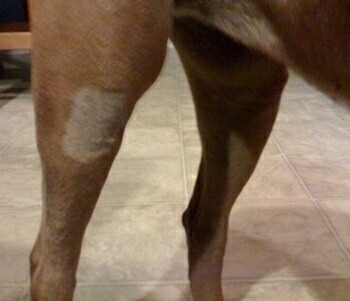 Notice the limp on her back right leg from her bad knee and the limp in the front where the fat was extracted. 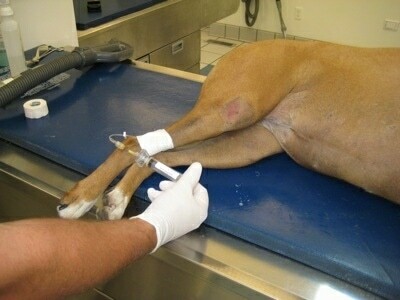 Video clip of dog walking pre-stem cell injection. By the end of the second day after getting the fat removed Allie was acting normally. 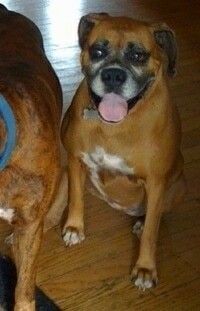 Allie was dropped off at the vet at 9:00 a.m. so she would be immediately available when the cells arrived. I was a little worried the cells would get lost in transit, however, was assured that even if they did get lost the Vet-Stem company had a backup supply back at their facility. FedEx delivered the stem cells at 10:30 a.m., just as Vet-Stem had promised. Allie was given Domitor to sedate her during the procedure. 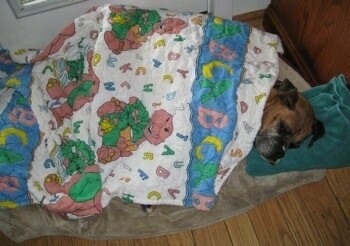 It has a rapid onset; the dog falls asleep in about 5-15 minutes. It is a reversible sedation that allows the dog to return to a normal “alert” status. Stem cells were administered with an IV throughout her body. And wrapped… Allie was then given Antisedan, the reversal drug for the sedative Domitor, to allow her to wake up. When I picked her up at 1:30 p.m. she was wide awake and happy. Happy to see me, happy to get into the car, happy to be home. You never would have guessed she had been poked and probed so many times if you had not seen her shaved areas and stitches. I had to take extra care she didn't start an all-out play session with Bruno. Not until those stitches are removed. After being home for an hour and a half she laid down on her bed and went to sleep. Now we wait to see if the stem cells do their thing; it can take up to a month. 11-3-08—Six days after the fat was removed and the stitches put in. 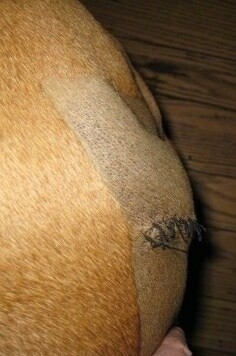 The area where the fat was removed has puffed out, something the vet had warned may happen. 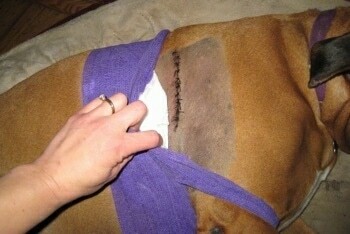 Allie's skin had been peeled back and the fat scraped off of the muscle. The skin needs to reattach. 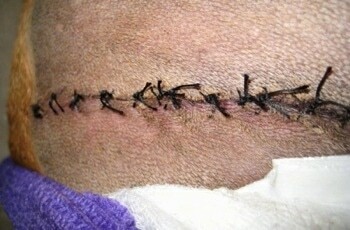 See how it has swelled up so you cannot see all of the stitches from a front angle. Amie and I wrapped Allie up in vet wrap, however within minutes the wrapping slides back down exposing the incision, and causing a bubble toward her front end. I realized we should have wrapped her differently, however we are out of vet wrap and I begin to worry it may be infected. I call the vet and they ask that I bring her in right away. 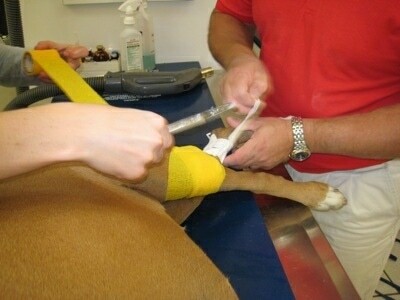 The vet tech wraps her up in a way that it will not slide down. What a great job! They say there is no infection. If there had been an infection we would smell it, and it would feel hot. It all looks normal. 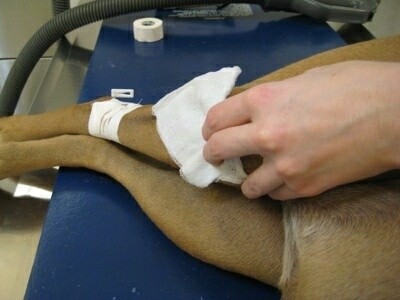 It needs to be wrapped for five days so it can reabsorb back into her body and the skin can attach back to the muscle. 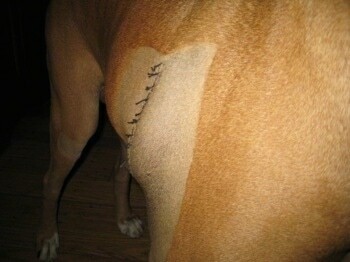 Allie's stitches were removed. She still needs to be wrapped tightly in a bandage because her skin is still not firm against her muscle and may fill back up with fluid if it is not fully healed. I have not heard Allie wince in pain in several days. I have also not allowed her much activity while she has been on the mend. Time will tell if her joints are actually feeling better. Eleven days ago the first step was performed; the fat was removed and sent away to the lab. Nine days ago the stem cells had been injected. Allie still needs something tight against her flabby skin where the fat was removed to keep it from filling up with fluid. After going through several vet wrappings and dealing with constantly adjusting it to stay over the flabby area I decided to take a shot at putting a tight dog shirt on her. She would normally take a size large, however I put a size medium on her so it would fit snug. I tucked gauze under the shirt over the flabby area to ensure the proper pressure. So far so good and I think it is much more comfortable than the vet wrap. Allie has had a setback. She somehow tweaked her right knee and will not set her leg on the ground. This has happened a lot in the past, where she does something that puts her knee out for a few days and it has always healed. It is just discouraging to see it happen when I was waiting for her to get better. Really hoping those stem cells are still in there doing their thing. Allie appears to be all better from her injury setback. I could see a difference in her walking from some limping in the morning to not at all by night time. She is now walking using all four legs and I hear no wincing in her breathing. She is still wearing a tight shirt to help her flabby skin where the fat was removed go down. She had a vet appointment today and her incision is pretty much all better. It is estimated she needs to wear the shirt for another week and then we can take it off. As of tonight Allie appears to be in no pain. I decided to go ahead and give her her monthly shot of Adequan. It cannot hurt to keep her on it for a while longer. I was able to take off Allie's tight shirt. The fluid has reabsorbed back into her body and everything has healed up nicely. 12-04-08—Allie is still limping on her right knee, however she has not been wincing. She seems to have good days and bad days. It is almost as if as soon as she starts feeling better she re-injures it because she is no longer being careful how she walks on it. I am thinking about getting an x-ray to make sure the joint is clear of any spurs or calcium deposits. 1-14-09—About 2 1/2 months later. Although Allie is not 100% better, she has significantly improved. She used to often whine and wince in pain throughout the day. She no longer does this, however she still does limp on her right knee. The biggest physical aspect everyone seems to be noticing is she has gained a lot of muscle mass. 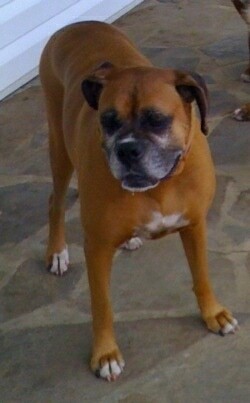 Allie was 75 pounds the day of the stem cell therapy. Two and a half months later her weight is 86 pounds. After—This shot was taken two months after the stem cell therapy. She outgrew her collar. I had to take it off and buy her a new one. Allie's back-end used to be very skinny, lacking in muscle to the point where I believe her bones were not being held into place as well as they should have been. Allie is given an Adequan shot once a month to stop any arthritis from progressing. Before the therapy I felt like there was not enough muscle to put the needle in and had to be extremely careful not to hit her bone. 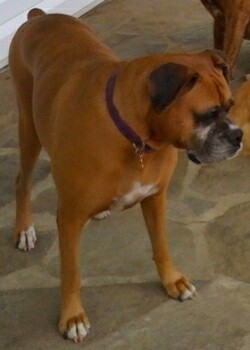 Before—Notice the amount of muscle in her hind legs and how skinny her back-end is. After—Two and a half months after the stem cell therapy. I believe the extra muscle is helping to hold her bones into place properly. She is in a lot less pain. Before—About two months before the stem cell therapy. Notice her back-end. It's very skinny and scrawny. Before—Two months before the stem cell therapy. 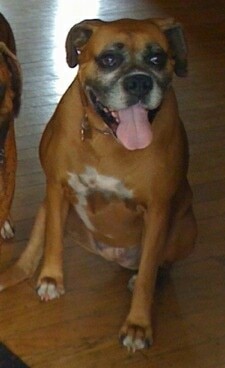 Allie at 75 pounds. After—Two and a half months after the stem cell therapy. Her muscle mass has really filled out. 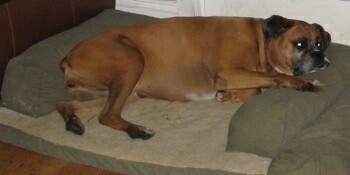 Allie at 86 pounds. 2 1/2 months after stem cell therapy. Allie has some stem cells banked at the lab and in a few months I am going to have them injected into her right knee. 4-16-09—Allie was injected with another round of stem cells into both knees. Since the cells were already banked the process was very simple. She was given 1.2 mL of Domitor IV and then both stifles were injected with the stem cells. With her first round of stem cells it seemed Allie would start to feel better and become more active, eventually damaging her knees once again before they had a chance to heal. That is what it seemed like anyway. This time around we are going to do our very best to restrict her from activity for the next two months in order to allow the cells to re-grow the necessary components of her knees. Not an easy task for a dog that starts to feel really spunky. The first round of stem cells she received did help her in a lot of areas. She no longer flinches in pain as she lays in her bed and she no longer cries or winces when she gets up from laying down. The issue she has right now is only her knees, her right knee being worse than the left. Later the same night Allie was a little sore from the shots, but she was still in good spirits. 4-17-09—Keeping Allie from being active is going to be a bit rough. Part of her job is to keep the fox away from the cats and off of the porch. She knows it's out there and she wants to chase it away really badly. "Allie girl if we can heal your knees you'll have plenty of fox chasing days ahead of you." 11-09-09—Allie's pain meds have been cut in half and I may be able to stop them altogether but just have not done it. 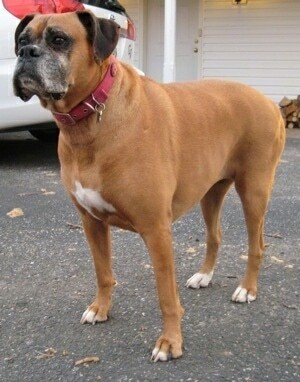 Her joints are not 100% like a young dog's would be and she cannot go for five-mile walks a day like Bruno the Boxer can, but she is no longer crying in pain and she can go for shorter walks. She used to lie in her bed and shake, even on pain meds. I am looking at her now and she is lying in her bed sleeping without shaking. That in itself is amazing to me. Allie is an extreme case. Both her knees and hips are bad. Without treatment I do believe I would have had to put her down. In hindsight, the treatment is something I would do again. Her quality of life has greatly improved.